AMC’s hit zombie drama The Walking Dead is going to have a strong presence at San Diego Comic-Con next week, which is pretty standard for the comic book-based series. We expect to see some significant reveals come out of that event, but just because they have big things in the works doesn’t mean that there won’t be anything for fans to gorge themselves on. 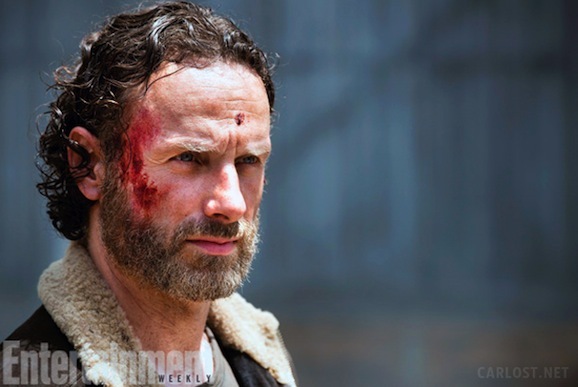 Four new photos from the upcoming season five have appeared online, and comic creator and series executive producer Robert Kirkman shared some details on the new direction of the show for season five. There are potential SPOILERS beyond this point. You have been warned. In our first episode, it’s very much going to focus on the story of Terminus. There’s a lot of big revelations that haven’t really come out that I think people are gonna be pretty startled by. There’s a couple other revelations that I think people might’ve gotten a little bit of a lead on. We’ll definitely be defining those in some cool ways and confirming some theories and shooting down others, which is very exciting. But I think the coolest thing about coming back to season 5 is that we really hit the ground running. What I mean by that is that we very quickly deal with the situation that we left them in — this trapped, victim situation where they’re kind of at the mercy of the people of Terminus. We really kind of expand the story from there very rapidly, so I think this is going to be a pretty fast-paced season with quite a bit going on. News is already out that Seth Gilliam has been added, and we’re bringing in new characters like we always do, and I think season 5 is going to be our best season yet. I think when people finally see the premiere, they’ll see what I’m talking about. There has been all kinds of speculation about Gilliam’s role, especially considering those leaked photos of him dressed like a priest. The easy leap here is to assume he plays Father Gabriel Stokes, a troubled man-of-god who, in the comics, the group encounters after they’re forced from the prison. The character description is vague, and sounds like to could go either way, but The Walking Dead has never been afraid to take characters from the comic and change them substantially. They’re also not above combing traits from multiple sources and moving forward like that. Kirkman doesn’t shed much light on the matter, beyond saying that Gilliam will be an important piece as the story progresses. He’s playing a character that’s very integral to the future of The Walking Dead. Who he is is possibly a very large hint to where the story is gonna go, if you’ve read the comic book series. So, we are playing that as close to the vest as the spy photos will allow, but all will be revealed very soon. There’s a lot of new stuff coming. Look, the thing that makes me the most proud of The Walking Dead is the fact that it is such a continually evolving show. We never rest on our laurels, we never go “that status quo works, let’s figure out a way to stay in that mode.” We’re always pushing boundaries and doing new things and changing the ways we tell stories. We tried some new things in season 4 and they worked pretty well and they helped tell some really great stories, and we’ve done that and now we’re moving on. We’re gonna do some new stuff, and a lot of that involves bringing in a lot of new characters. There’s going to be some big changes ahead, and it’s gonna all be cool stuff. All I’ll say about that is that the Rick that’s faced the Governor is very different from the Rick that is now gonna be facing the people of Terminus. As we saw in the final moments of season 4. I think that he’s definitely a more capable Rick and a more prepared Rick, and while the situation might actually be far more dire and deadly and dangerous, he’s possibly going to handle it much better. I think we’ll see a very different way of handling conflict this season. These new photos don’t reveal much about season five that we don’t already know. There’s the one at the top of Rick looking grim and determined. Out of everything Kirkman said, I’m most excited to see Rick finally become the character he was meant to be. As far as adaptations go, I’m pretty flexible when it comes to details and plots and mechanics, I understand the need for alterations and adjustments from one medium to another, as long as they get the characters right. That’s all I really care about, and the Rick on TV is a drastically different Rick from the one I’ve been reading for years. Hopefully the two can find a place to meet this season. 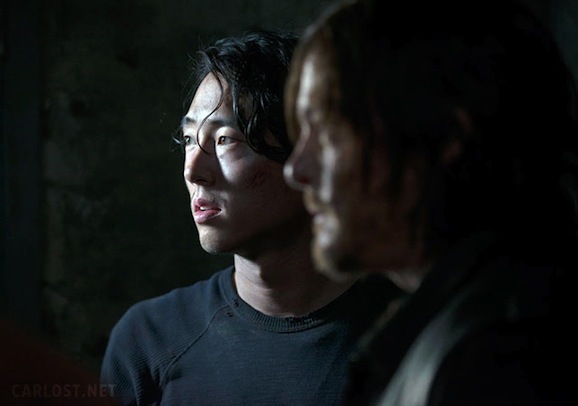 Glen (Steven Yeun) and Daryl (Norman Reedus) appear to still be trapped in that train car at Terminus, so not much has changed in their situation for the time being. 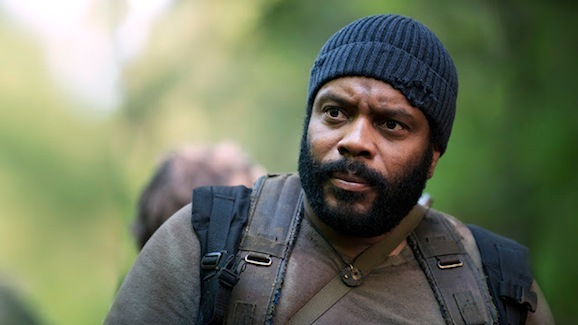 And the same goes for Tyreese (Chad Coleman) and Carol (Melissa McBride). 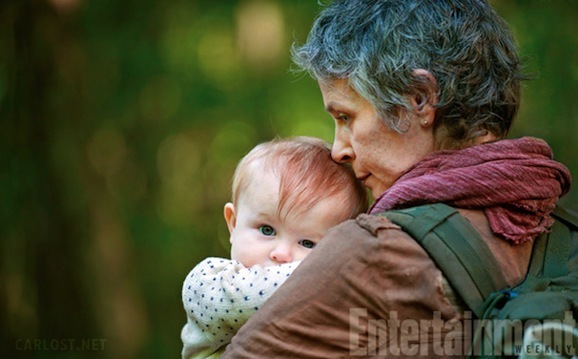 Wandering around the wilderness with Rick’s infant daughter Judith, these are two of a precious few characters not trapped at Terminus, so it will be interesting to see how their story progresses. Especially considering that Tyreese and Carol hook up for a time in the comics. Things keep getting curioser and curioser.